SEPTA has doubled the number of subway stations scheduled to be open during the papal visit in late September. The transit agency announced Tuesday that it adjusted its service plan after considering requests from riders and businesses. Trains on both the Market-Frankford and Broad Street lines will operate both inbound and outbound on Saturday, Sept. 26 and Sunday, Sept. 27 — the dates Pope Francis will host massive public events in Center City. 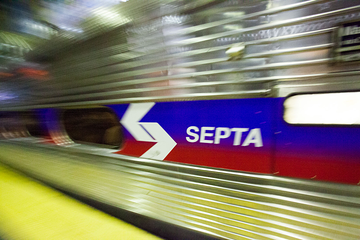 Trains will run from 5:30 a.m. to 1 a.m.
Additionally, SEPTA is offering credits to weekly and monthly pass holders affected by the papal visit. People who purchase monthly TrailPasses or TransPasses for September will be eligible to receive a $5 credit on the purchase of a monthly pass in October, November or December. Weekly TransPass customers who purchase a pass for the week of Sept. 21 can receive a $2 credit on any weekly pass through the end of the year. Weekly TrailPass customers with a pass from all zones can receive a $10 credit on a future pass. • Eastbound Express Service will run from 69th Street Transportation Center directly to 30th Street Station. Trains will then continue with local service, stopping at Eighth Street, Second Street, Girard, Huntingdon, Allegheny, Erie-Torresdale, Arrott Transportation Center and Frankford Transportation Center. 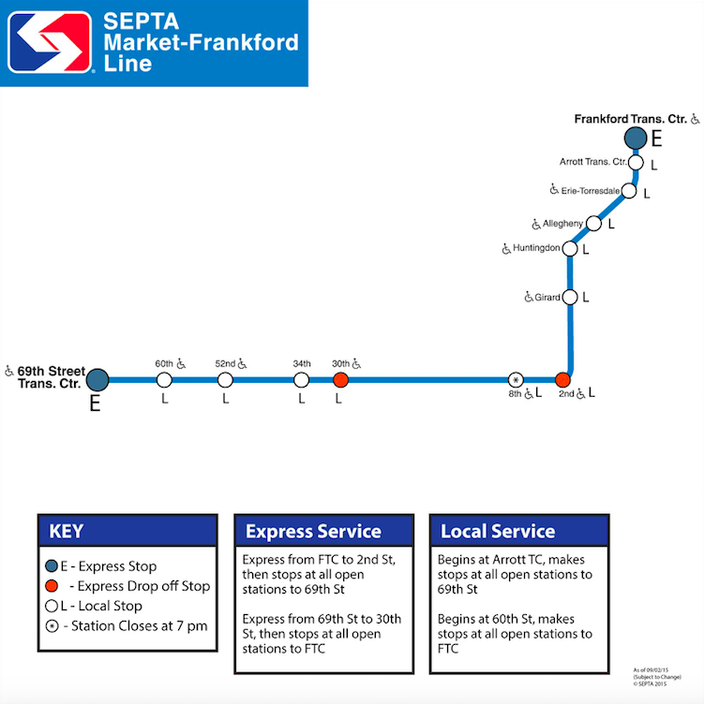 • Westbound Express Service will run from Frankford Transportation Center directly to Second Street. Trains will then continue with local service to Eighth Street, 30th Street, 34th Street, 52nd Street, 60th Street and 69th Street Transportation Center. 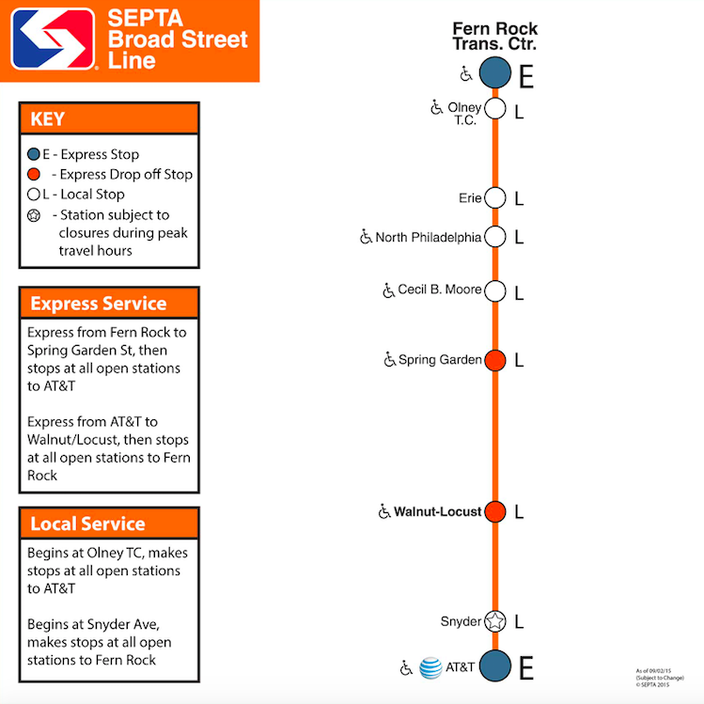 • Eastbound Local Service will originate at 60th Street Station. Trains will stop at 52nd Street, 34th Street, 30th Street, Eighth Street, Second Street, Girard, Huntingdon, Allegheny, Erie-Torresdale, Arrott Transportation Center and Frankford Transportation Center. • Westbound Local Service will originate at Arrott Transportation Center. Trains will stop at Erie-Torresdale, Allegheny, Huntingdon, Girard, Second Street, Eighth Street, 30th Street, 34th Street, 52nd Street, 60th Street and 69th Street Transportation Center. • Northbound Express Service will run from AT&T Station directly to Walnut-Locust Station. Trains will continue with local service to Spring Garden, Cecil B. Moore, North Philadelphia, Erie Station, Olney Transportation Center and Fern Rock Transportation Center. • Southbound Express Service will run from Fern Rock Transportation Center directly to Spring Garden. Trains will continue with local service to Walnut-Locust, Snyder and AT&T Station. • Northbound Local Service will originate at Snyder Station. Trains will stop at Walnut- Locust, Spring Garden, Cecil B. Moore, North Philadelphia, Erie, Olney Transportation Center and Fern Rock Transportation Center. • Southbound Local Service will originate at Olney Transportation Center. Trains will stop at Erie, North Philadelphia, Cecil B. Moore, Spring Garden, Walnut-Locust, Snyder and AT&T Station.